We have hidden oceans deep inside each of us, waiting to be uncovered. Pictures dive deep into your innermost being. They retrieve lost treasures you never knew were there; feelings, dreams and possibilities you didn't even know you had. I'm Chris Aerfeldt. My surname can look a bit confusing, so in case you were wondering, it's pronounced Air-felt. I'm a fruit salad of nationalities. The name is actually Swedish but my parents are Estonian, I was born in Australia and my husband is French-Catalan. I was awarded a scholarship to do my art degree in Adelaide, followed by another for a Masters at Chelsea College of Art in London. 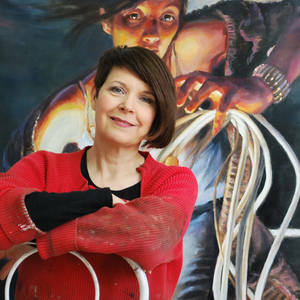 Prominent collectors including Charles Saatchi and David Roberts invested in works, and the University of the Arts, London, also commissioned one of my Knitting Lady paintings. I exhibit internationally - in Australia, Europe and London (I guess London doesn't count as Europe any more). My mission, in art and life, is to help people understand how precious and valuable they are. There is a sacred and mystical aspect to the common business of everyday life. Our days are so taken over by thinking and knowledge that our inner emotional life gets starved. Pictures have a way of getting under your skin, before your brain even realises what's happening. Home is Montpellier in the south of France, and I mangle the French language less as time goes by. By the way even though we are by the ocean I hate sailing (childhood boat traumas). Just saying.